Shanghai has an unusually short history for such an incredible city. Folks who visit often hardly get their bearings before they head off again, either to the next destination on their tour of China or home after a week's business trip. Shanghai is certainly unique in its cultural division between Pudong and Puxi. And if you're staying in Shanghai longer than a night or two, it's important to understand the difference between the two places. It'll help you get oriented and it could save you time and confusion. The names of these areas of the city come from their locations in relation to the Huang Pu River (黄浦江). One lies to the east (dong), thus Pu Dong (浦东). One lies to the west (xi), thus Pu Xi (浦西). Pronounced "poo shee", Puxi is the historical heart of the city. In former foreign concession times, this was the area that hosted the multitude of foreign nationals from the mid 19th century to the second World War. The area had a French Concession and an International Concession as well as a walled Chinese area. It is in this area that (what's left of) the historical houses and buildings, the Bund and the famous Art-Deco heritage architecture are found. Puxi is where the Hong Qiao International Airport (SHA) is located as well as the two train stations and the long-distance bus terminals. The landscape is almost infinite. Stretching from the edges of the Huang Pu River on the east, Shanghai in Puxi blossoms outward in all directions. If you're driving from Shanghai to Suzhou (in Jiangsu Province) or Hangzhou (in Zhejiang Province), it will feel like you never left the city. And it's difficult to tell just where "downtown" is. As you move west, hurtling in a taxi, most likely along the Yan'an Elevated Highway, you'll pass clusters of skyscrapers around People's Square, along Nanjing Road, and then further out toward Hong Qiao. Puxi is a never-ending mass of office towers and residential compounds. Pudong, up to perhaps 30 years ago, hosted many warehouses as well as farming and fishing communities. Now, it is home to some of the tallest buildings in China, like the SWFC, as well as Shanghai's financial center. Pudong is home to Pudong International Airport (PVG). It is connected to the rest of the city with many tunnels, bridges, metro lines and ferries across the river. Pudong's landscape differs from Puxi's in that it is finite. The Huang Pu River cuts off this piece of land into a virtual island so eventually, if you keep driving, you'll find the sea. 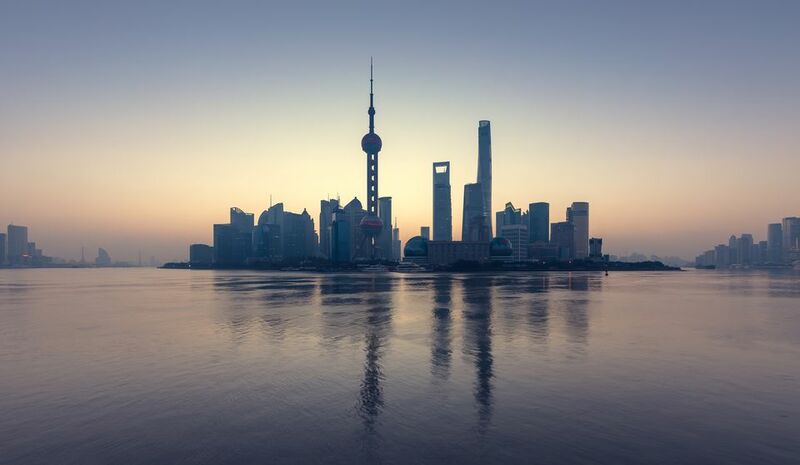 (There aren't any beaches to speak of so no need to bring your swimmers along...) Pudong's tall buildings are clustered around the financial center in Lujiazui and it's here that you'll find many of Shanghai's most luxurious residences and hotels. Farther out, you can still find some small farm operations that haven't been bulldozed into residential compounds. Some view Puxi as Shanghai's past and Pudong as the future. It's impossible to tease one out from the other but if you simply take in the skylines of the two sides of the river, it certainly gives you presence in two times at once.